Nias, the last Megalithic Island, is the largest of 131 islands in the “Nias Archipelago” off the west coast of North Sumatera in Indonesia. Nias Island covers an area of about 5,000 square kilometers—slightly smaller than the well-known tropical vacation spot of Bali. Villagers transporting a megalith, 1915. Source: Creative Commons, Ludwig Borutta. A myriad of beautiful beaches surround the coast of Pulau Nias (Nias Island), many of which are most often deserted. The beaches are not only plenteous, but also diverse; from gently sloping, soft, white sands, to rocky reef lagoons and high cliffs. Best known as an international surfing destination, Nias is also home to one of the last remaining Megalithic cultures in the world. 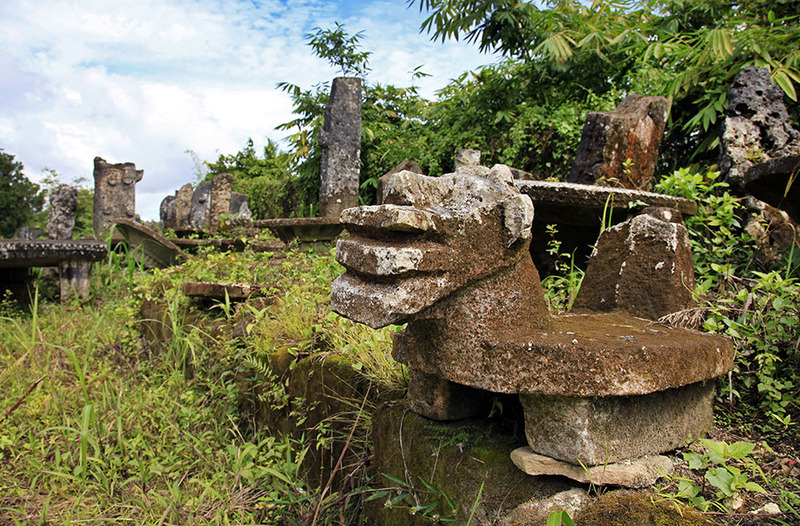 Megalithic standing stones can be found across Nias Island, as well as huge, round stones which were used for money. 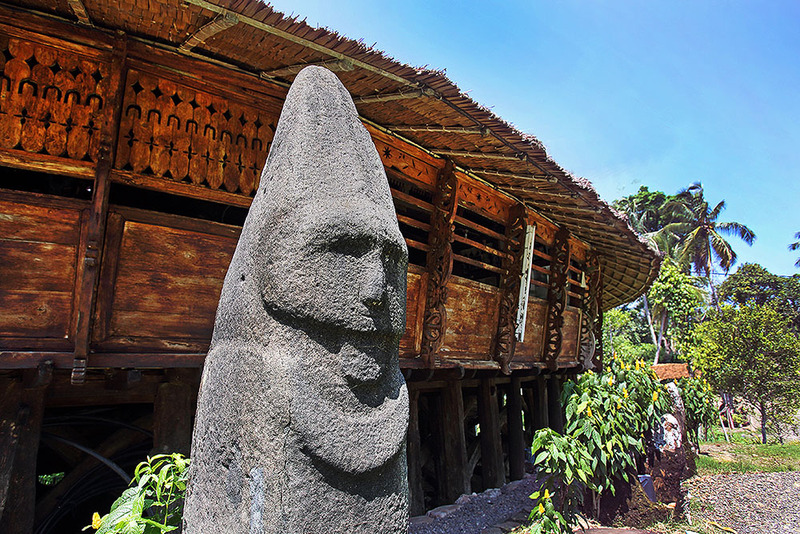 In the Gomo area, towards central Nias, ancient stone carvings as well as free-standing menhir stones can still be found today. All menhirs are erected at least 500 meters above sea level to avoid possible destruction by tsunamis, which have frequently swept the island for thousands of years. Many of Nias’ menhirs stand 2 – 3 meters tall and are carved in the form of the female body. Some researchers say that this represents the goddess of fertility. However, others believe that is evidence of an ancient Matriarch society. In many areas of the world, Menhirs have lost their function as a sacred object, and are left merely as archaeological remains. But not on Nias. Till today, Niasans preserve the megalithic rituals, and new menhirs are still erected. Great megalithic structures can also be found built in circular or arch shapes, some dating back over 3,500 years—the oldest found in Indonesia. They were built in commemoration of the great ancestral chiefs who had died, or in praise to the Creator of the universe. These monuments can be found in LahusaIdanotae, Tetegewo and Tundrumbaho. Due to the island’s remote location, it’s easy to presume the people of Nias to have lived for centuries in isolation. Strangely though, this is not so. This marvellous island holds almost prehistoric records of trade with merchants from the Middle East, Europe and Mainland Asia. Though not alienated from the outside world, Nias has managed to keep its own unique culture remarkably intact; bypassing Indian, Islamic and European Influences that have swept across Asia. Some historians and archaeologists argue the island to be one of the few remaining Megalithic cultures still in existence. The predominant religion today is Christian Protestant at about 86%. The remaining 14% are equally divided as Muslim and Catholic. Nonetheless, until this day, Niasans continue to practice their indigenous culture and tradition. On the island of Nias, boys from the age of 7 practice the ancient traditional art of boulder jumping. As their age increases, so does the height of the boulders they dare defy. For the young men of the Nias tribes, boulder jumping is part of a series of tests to prove their courage and maturity as a warrior. According to tradition, Nias Warriors must be strong, skilled in martial arts, and trained in black magic. The last and final test for the warriors is to leap over massive stones, measuring as high as 2 meters without so much as touching the surface. Stone jumping on Nias Island is referred to as HomboBatu or Fahombo, and is a tradition that has been faithfully practiced and preserved for centuries. The tradition of stone jumping first began during a time when inter-tribal wars were widespread across the island. The tribes of Nias are a warring people. Provoked by vengeance, border disputes and slavery, every village fortified its territory with high stone walls, fringed with sharpened bamboo stakes across its top. 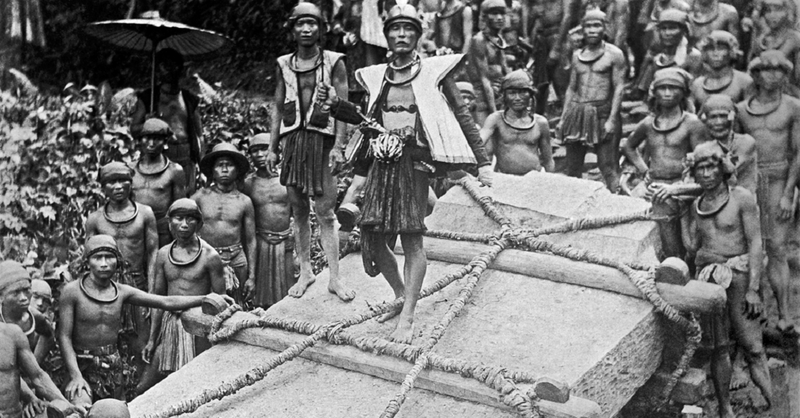 This is where the Nias Stone Jumping tradition was born. It was an art whereby warriors could invade a rival village by means of nothing but pure muscle, strength and skill. 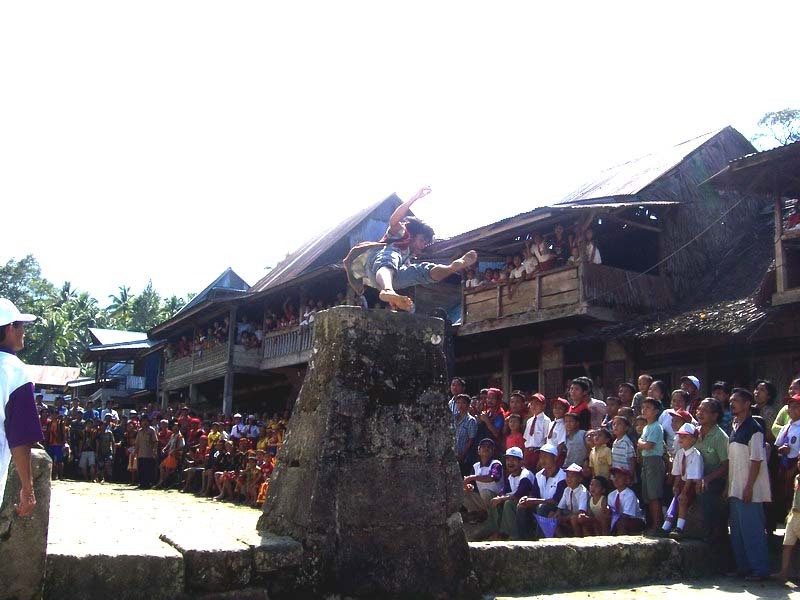 In modern times, the Nias Stone Jumping tradition is not done in war or violence, but rather as a ritual and symbol of Nias Culture. Young men who successfully achieve this skill are considered to have reached maturity and crossed from childhood into adulthood. Like most places worth going, Nias Island in Indonesia is not easy to reach. By air, start by flying to the Polonia Airport in Medan, North Sumatra and catch a flight to Binaka Airport,Gunung Sitoli. Daily flights are available from Medan to Gunung Sitoli on Merpati Nusantara Airlines and Wings Air. International flights to Medan are available from Singapore, Bangkok in Thailand, and Kuala Lumpur, Penang, Ipoh, Malacca and Subang in Malaysia. To go by sea, start at the Sibolga Port in Sibolga city on the Northwest coast of Sumatra. Take the ferry to the port of Gunung Sitoli on Nias Island. The trip takes between 8 and 13 hours, depending on weather conditions.